Hot pasty mania is gripping snowy London today as the food Cornwall gave to the world takes over the capital. Giant couple, Mr and Mrs Pasty, led a team from the far south west at the start of the first-ever Cornish Pasty Week – a grand celebration of an industry worth £300 million a year just in Cornwall. 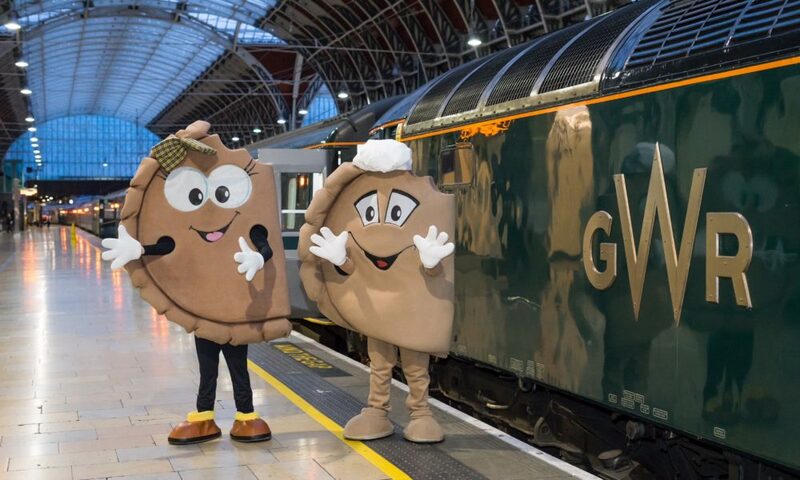 Early morning commuters at Paddington Station did a double take as Mr and Mrs Pasty stepped off the GWR Night Riviera Sleeper from Penzance and prepared to spread Oggy Mania around some of London’s most famous sights.With the aim of putting a warm “pasty smile” on everyone’s face, the pasty posse handed out hot samples of the celebrated foodstuff made popular across the globe from Canada to Australia by emigrating 19th Century tin and copper miners and their families. Mr and Mrs Pasty and industry leaders are now heading for an open top bus tour of London, courtesy of The Original Tour, visiting landmarks such as Buckingham Palace, Nelson’s Column and the London Eye to spread the pasty love. This afternoon (Monday) the Cornish Pasty Association, the trade association behind the initiative, and George Eustice MP for Camborne and Redruth and Minister of State for Agriculture Fisheries and Food, will host a reception at the Houses of Parliament. This is chance for pasty producers and members of the Association to stress the vital economic importance of the Cornish pasty industry at the very heart of government. At least 120 million Cornish pasties are made each year and the £300 million worth of trade generated is around 20 per cent of the total turnover of Cornwall’s food and drink sector. So important is the industry, the Cornish Pasty was granted protected EU status in 2011. At least 2,000 people work in pasty production. Many of these jobs are year-round, full time, permanent jobs. Hundreds of bakeries, cafes, shops and factories with help spread ‘oggy mania’ throughout the UK from now until the end of the week. From pasties at the Palace to pasties at Westminster, everything will be captured and posted on the Cornish Pasty Association’s Facebook and Twitter pages, using the #CornishPastyWeek. Throughout Cornish Pasty Week, pasty producers, bakers, shops, staff and customers will all be joining in. And there will be more! Be sure you follow all the highlights of the week on Facebook @cornishpastyassociation or Twitter @Cornishpasties1 for the latest updates, news, promotions, events and activities. Cornish Pasty Week has grown out of the World Pasty Championships held at the Eden Project every year on the nearest Saturday before St Piran’s Day. The grand finale of the week will be the seventh annual championships at Eden on Saturday March 3 when pasty-makers will descend from around Cornwall, the UK and the world on the home of the famous Biomes near St Austell. The day of celebration culminates in the Oggy Oscar awards for the best junior, amateur, professional and company pasty-makers and a special Pasty Ambassador Award. To find out more go to www.edenproject.com. All pasties in the takeaway and deli at The Great Cornish Food Store in Truro are on sale at a special price of £2.50 all week. These are the creation of Mr Graham Cornish, first ever winner of the World Pasty Championships, who will be in the store in Friday for tastings, demos and pasty banter.